Usually Lego and video games cross over via games based off existing toy sets, but the reverse is true with the new Lego Overwatch range, and the result is quality sets that leave one eager for more. When I was a kid, I had two primary obsessions: video games and Lego. The two have never really been all that far apart: I have fond memories of the amazing Lego Island sandbox game, and once Lego partnered up with Traveller’s Tales it really found its gaming groove – but even then I was very surprised to see officially licensed Overwatch Lego hit store shelves. Plus, here’s the thing: these sets are absolutely awesome. Now, I know, some of you might be shaking your head. I know I am a grown man, but what’s the point in being a grown-up with disposable income if not to go in harder than ever before on the things you loved as a kid? I’ve been going down that path here and there with Lego, and to see an actual video game franchise turned into proper Lego sets is exciting. So, yeah – of course I wanted to check out the Overwatch sets. In a way Overwatch is the perfect fit for Lego. Founded in the wake of the first world war and in the build-up to the second, the company has always been iffy on the concept of featuring franchises with more realistic depictions of violence, which is presumably why things like Halo and even bizarrely Call of Duty ended up with Mega Bloks sets. Overwatch fits into that same sort of zone as something like Harry Potter or DC Super Heroes however: driven by conflict, but fun and colorful. In the nineties, Overwatch surely would’ve been the subject of a Saturday morning cartoon. The initial range of Lego Overwatch sets is six strong, though hopefully it’ll expand in the future. It ranges from the $15/£13 range right up to $90/£80, featuring a range of heroes and familiar set-pieces. 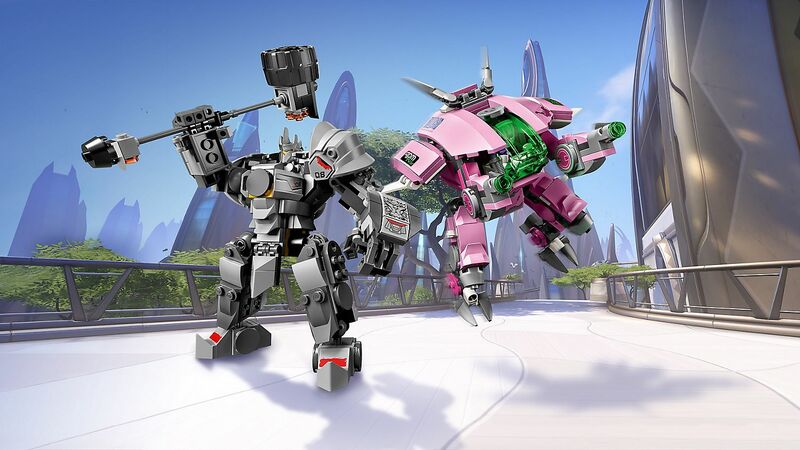 There’s a Lego payload that comes with Tracer and Widowmaker, for instance, but there’s also detailed Lego versions of larger heroes like Bastion, D.Va and Reinhardt. The most expensive set is a recreation of a chunk of the Watchpoint: Gibraltar map. The biggest and most pleasant surprise isn’t just the introduction of these sets, however – it’s how lovely each is. I’ve built a couple of them now – the cheapest payload-based set and the mid-range D.va and Reinhardt set – and the quality of each build is really quite something. This is the sort of set that Lego could’ve easily phoned in, knowing that fans and collectors would pick these up anyway – but instead these are intricate, fun builds that end up looking surprisingly screen-accurate. One of the things I’ve been most impressed by is how play-friendly these are. Overwatch is an action-based series, after all – and the D.va and Reinhardt mech and armor builds both come with moveable joints for articulation, allowing you to pose the figures. D.va’s mech even has actual Lego stud-shooting guns. Both are probably a little oversized compared to their in-game counterparts, but it’s nice that the mini figures of each hero naturally sit inside just as in the game. 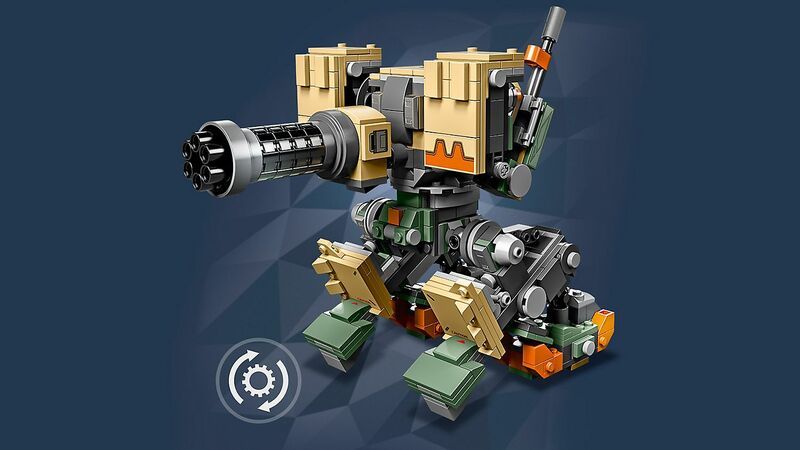 I’ve not had a chance to check out Lego Bastion yet, but given it actually transforms I now want to. For nerds like me the builds make use of ratcheted joints and the like to allow stability if you want to set a pose and pop them up on a shelf to display. It’s cool stuff, and makes these quite functional as both toys and neat Overwatch collectibles. I love dumb trinkets for my office, but I’d honestly rather have more of these than a 300 quid statue that’s over a foot tall, hyper-detailed though they are. Like the very first time I laid eyes on a Lego Star Wars set at ten years of age, seeing Lego Overwatch also just sets the mind on a runaway train of thought, listing out dream pairings for the building toys and video games. We already had Lego Minecraft, of course, but that fit was so obvious that it dulled the significance. Overwatch is something else. Gaming figures and collectables are, of course, big business, and as Lego conquers most of the movie space worth bothering with, one can’t help but ponder where else this might lead. More Overwatch sets would be nice, yes, but other series’ quickly come to mind. Peach’s Castle would be cool. Portal made an appearance in Lego Dimensions, and a real world test chamber set has a lot of potential. Top of the list for me would be a Lego Zelda set, obviously, and VG247 already reported on a fan-made Lego Sonic the Hedgehog set vying for the company’s attention on their official submit-a-design website. I’m sure you have one in mind, too. Here’s hoping this is the start of the great Lego and video games cross-over going back in the other direction – where gaming’s best characters invade the world of plastic bricks in the real world. If nothing else, it’d give me an excuse to start reviewing Lego.